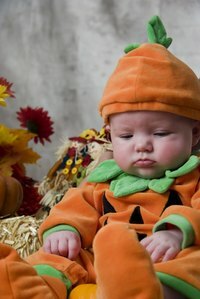 Pumpkin costumes are one of the more popular Halloween ideas, especially for children. These costumes are generally easy to put together and leave plenty of room for imagination and creativity. This pumpkin costume pattern makes for a cute, round pumpkin with a matching stem top. It can be fitted for a variety of sizes, depending on the child, and adults can alter the measurements to create their own. With a simple sewing machine, this costume can be made in less than an hour. Cut orange fabric into two 36- by 48-inch sheets with scissors. Create a 1/4-inch crease around each fabric sheet's edge and pin it in place with straight pins. Use a sewing machine and matching orange thread to hem the 1/4-inch edge in place. At the top and bottom of each sheet, fold the edge down about 1 inch for the elastic. Use straight pins to hold in place and sew. Use a bright yellow marker to draw the jack-o-lantern face onto the black felt. The eyes and nose should be about the size of the costume wearer’s hand. The mouth should be double that size. Cut out the face shapes and pin to the costume. Use black thread and the sewing machine to sew the face to the front of the orange pumpkin body, making sure to follow along the shapes' edges. Turn the front orange sheet around so the inside faces out. Lay the back orange sheet on top of the front sheet, with the inside facing up. Line up the edges evenly and pin in place. Leave 6 to 8 inches at the top for the arm holes. The arm holes may be smaller or larger depending upon the child’s size. Use the orange thread to sew the two orange sheets together on the left and right sides, carefully avoiding the areas made for the arm holes. Do not sew over the top and bottom elastic edge created in Step 2. Turn the costume inside-out. Thread the elastic through both top and bottom edges. Slip the costume onto the child to determine how tight the top and bottom areas should be. The top elastic piece with create the neckline and the bottom elastic piece allows the costume to obtain its round appearance. Tie elastic into place. Trace the paper plate onto two large pieces of excess orange fabric. Pin the edges together with straight pins, leaving about 3 inches open. Insert scraps of fabric into opening to stuff the hat. Stitch around the edges with the orange thread using the sewing machine. Cut two 3- by 3-inch strips of green felt. Stitch the edges together with green thread and leave the top open. Stuff with small scraps of fabric and stitch the top closed. Attach four silk leaves to the bottom of the stem and place in the center of the orange top. Stitch in place with green thread. Fabric glue can be used to hold the costume together, but it will not hold as long or as well as thread. Sew an elastic strip onto each side of the orange top to create a chin strap that will keep the top in place.